On the first Saturday of every month (except January) we hold an open day at our Sustainability Centre in Carindale. And everyone is welcome! Michelle Gleeson – entomologist & director of BugsEd. April 2016 Open Day. The Open Day starts at 9am. Grab a cuppa and check out the native plant nursery. There’s a presentation at 9.30am for approximately one hour. Each month there is a different speaker (paid by our environment fund) on an environmental and/or sustainability issue. Following that we have a yummy morning tea! And enjoy a tour of the community gardens. We usually have natural honey, jams and Boomerang Bags for sale. We don’t have EFTPoS so you may like to bring your spare change. The event is normally finished by 12pm. February 2nd: Guest Presenter – Dr Selina Ward – from UQ’s School of Biological Sciences. Talking about caring from source to sea. March 2nd: Guest Presenter – Michelle Gleeson – entomologist & director of BugsEd. April 6th: Anika Lehmann – koala rescuer and carer. May 4th: Emily Kain from Australian Conservation Foundation. June 1st: Dr Tim Heard from Sugarbag Bees – talking about bees. July 6th: Launch of outdoor classroom at the Sustainability Centre. November: Rachael Smethurst. Fauna Spotter Catcher. Talking about her experiences with wildlife. October: Dr Jennifer Firn. PhD. Associate Professor – Science & Engineering Faculty (QUT). Editor in Chief of ‘Ecology & Evolution’. Talking about controlling invasive plant species. September: Dr Elisa Bayraktarov. Ecologist. Threatened Species Recovery Hub. University of QLD. Talking about the threatened species index. August: Hyahno Moser, Program Manager with Nature Play QLD. Talking about developing a love of nature in children and nature as brain food. July: Tamielle Brunt, Wildlife Queensland Ecologist & PhD candidate, University of Queensland. Talking about platypuses. June: Jutta Godwin, Cubberla-Witton Catchments Network & QLD Mycological Society, talking about the world of fungi. May: Meg Edwards, PhD Researcher from Hidden Vale Wildlife Centre (UQ) presented on her bandicoots research. April: Ray Ison (Brisbane Catchments Network & many other groups) spoke about Orangutans. March: Robert Whyte, citizen scientist, photographer and co-author of ‘A Field Guide to Spiders of Australia’ spoke about spiders. February: Revel Pointon, Solicitor, Environmental Defenders Office, QLD, talking about law and the environment. February: Jessie Cappadonna, QUT PhD student & management committee member of Australian Citizen Science Association, re citizen science. March: Australians for Dolphins’ Jordan Sosnowski. April: Andrew Stovell, Arborist, talking about habitat trees. May: Anne Cleary, Environmental Scientist at Griffith Uni. Re health and well-being through nature connection. June: Sustainability Consultant Jane Milburn of Textile Beat talking about waste, sustainability and the slow clothing movement. July: All about squirrel gliders! With B4C’s Rachael Williams and Stefan Hattingh and Naomi from Geckoes Wildlife who brought a range of Aussie critters including a squirrel glider. August: Robert Pekin of Food Connect Foundation / Food Connect founder told us about the challenges and opportunities in providing sustainable and local food production and consumption. September: Professor Robert Capon (biologist) re the Cane Toad Challenge told us about the cane toad tadpole trapping technology that uses toad pheromone to lure toad tadpoles into a trap. October: Green Dean spoke about longevity and how food and gardening habits in various countries and cultures impacts how (and how long) we live. November: Leigh Weakley, B4C Nursery Manager re designing your garden for water efficiency, pollinator-friendliness and more. December: John Moss of Native Plants QLD talked about Mistletoe. February: Jock Mackenzie from Mangrove Watch at JCU / Tropwater gave us a presentation on local mangroves and issues regarding the condition of our wetlands. March: A fermented food presentation, demo and tasting by Roslyn and Mario Bono. 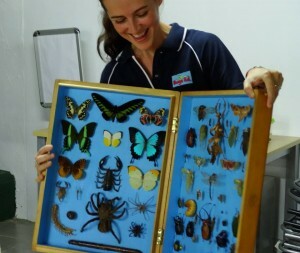 April: A presentation on bugs by entomologist and director of BugsEd, Michelle Gleeson. There was also some insect-inspired original artworks on display by artist Martine Lloyd. May: A presentation on natural resource management by Andrew Davidson, winner of the Catchment Care Luminary Award. June: Dean Bleasdale, AKA ‘Green Dean’, gave us a presentation on ‘urban farming’ and his recent trip to Korea. July: Mike Fox of Pollinator Link & Mt Gravatt Environment Group gave us a presentation on Pollinator Link and got locals signed up to the program. August: Professor Darryl Jones, Griffith University, on “fauna movement in Brisbane”. November: Gail Allsop spoke about and demonstrated natural solutions with herbs, essential oils & plant uses. December: Debbie Pointing, President of Koala Action Group. For more events, check out our events page.